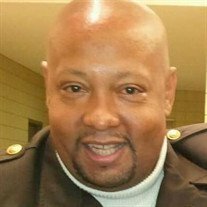 Obituary for Dwayne Roger Fair | E.F. Boyd & Son, Inc.
Dwayne Roger Fair passed away suddenly on August 10, 2018 in Cincinnati, OH. He was the beloved father of Dwayne, Jr. (DJ) and Devin, loving grandfather of MaKayla, cherished son of the late George and Doris Fair, dear brother of Roy, Janice (deceased), Marcia, Winston and Lorraine, uncle of many precious nieces and nephews and loved by many other relatives and friends. A Memorial service celebrating his life will be held on Saturday, September 8th, 10:30 AM at the E. F. Boyd & Son Funeral Home, 25900 Emery Rd. where family will receive friends 1/2 hour prior to service.